How did the current digital revolution begin? Was it the computer scientists of ARPANET, MIT and Stanford University that should be cheered? Maybe. But what about all the thousands upon thousands of little people. Kids that started playing with computers, learning to program them, and then going on to be the next generation of computer scientists. For many IT professionals today their journey started with the humble, yet revolutionary, Sinclair ZX81. The ZX81 was a wonderful little machine. Boasting 1K of memory it was a powerful computer that most homes could afford. It used to sell for around £70 in high street shops such as WH Smiths, or only £50 for the build it yourself kit. Still far cheaper than any introductory computers today. Yes, the 81 in the ZX81 refers to the year it was born, 1981. The 70’s were barely over, people were still wearing flares, many homes still did not have colour televisions, music was still mostly listed to on LP’s and Beetamax and Video2000 were still competing against VHS in an attempt to dominate the home video market. Many people have developed excellent careers in computing as a result of being the lucky owners of a ZX81 30 years ago. Speak to any really good computer programmer that is approaching his 40’s and he probably had a ZX81 as a toy. 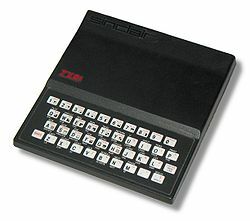 Over 1.5 million people owned a ZX81. In America it was sold as the Timex Sinclair 1000 and Timex Sinclair 1500, and many other countries produced their own versions. Did you own a ZX81? Do you still program today? Do you still own your ZX81? Maybe time to bring it out for old times sake, and plug it into to your high definition LCD screen, just to wish it a happy birthday and thank it for helping you become a successful programmer. “L’initiateur”… The advertisement in the french magazines didn’t lie: the ZX81 initiated me to programming and I spent hours and hours coding in BASIC with that wonderful machine. I’ll always be grateful to my father for buying it to me.